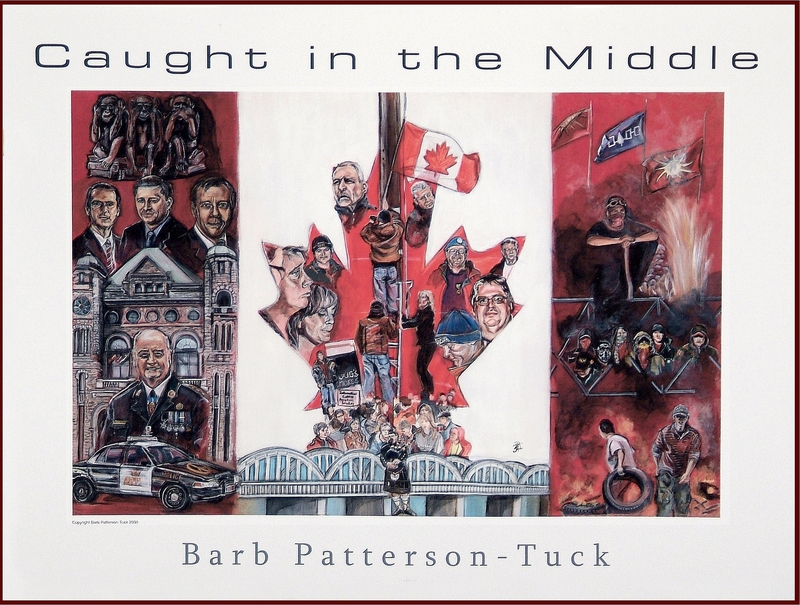 In the Spring of 2008 Caledonia artist Barb Patterson-Tuck released a painting depicting her impression of the Caledonia crisis and the roles of various individuals involved. The work is called ‘Caught in the Middle,’ and it portrays how innocent people are caught between the inaction of the OPP and politicians (hear no evil, see no evil, speak no evil) and the violence and intimidation of native protesters. 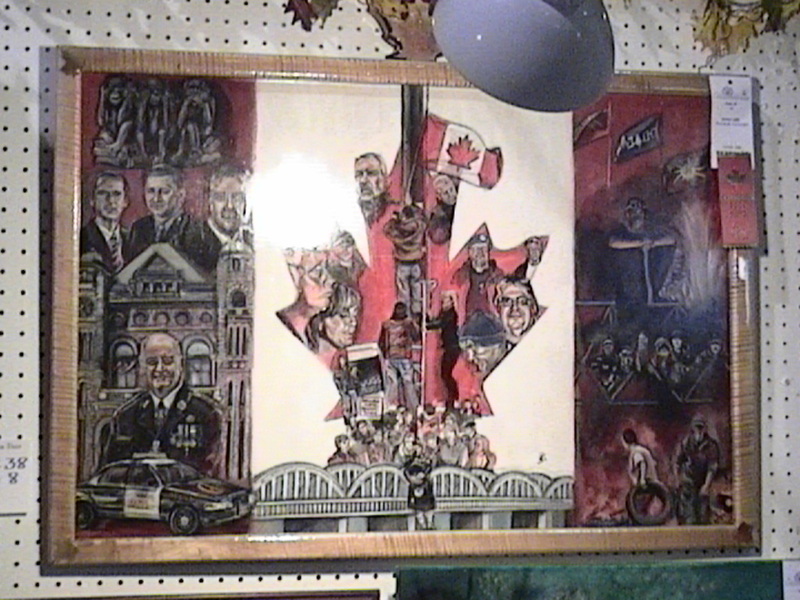 The centre of the painting – the maple leaf – recognizes the victims of race-based policing as well as those who have been most active in attempting to restore the rule of law to her town. 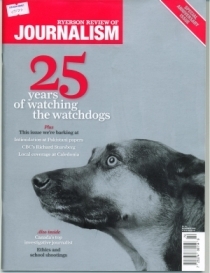 It includes portraits of three CANACE founders: Gary McHale, Merlyn Kinrade, and Mark Vandermaas. Gary McHale is wearing glasses at the lower right side of the maple leaf. 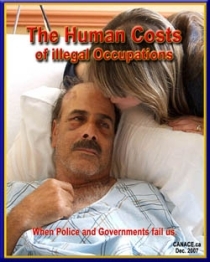 Mark Vandermaas is above Gary to the left and is portrayed with the blue UN beret worn during a Jan 20/07 protest when he tried (unsuccessfully) to get senior OPP officers to meet with us. 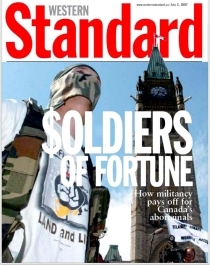 Merlyn Kinrade is facing left at the upper point of the maple leaf. 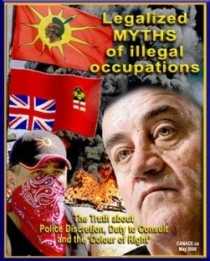 VoiceofCanada, May 16/08: Fantino home protest video – we will not give up our rights! 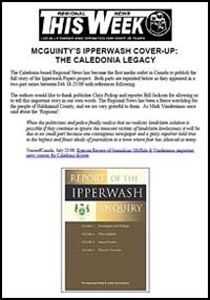 Caledonia residents Dave Brown and Dana Chatwell are on the left side of maple leaf facing right while Chris Syrie is depicted just above Dana, below Merlyn. Brian Hagan is on the right side of maple leaf just above Gary McHale. Doug Fleming’s brother, Randy, is just below Gary wearing the blue toque. The left side of the ‘flag’ portrays (L to R) Ontario Premier Dalton McGuinty, Prime Minister Harper, and former Ontario Minister of Aboriginal Affairs Michael Bryant. Above the three politicians most responsible for Caledonia’s misery are the ‘hear no evil, see no evil, speak no evil’ monkeys that serve as an apt metaphor for their shameful tolerance of the violence, crime and intimidation caused by the native militants on the right side of the painting, and of the outrageous civil rights abuses committed by OPP Commissioner Julian Fantino and his force. 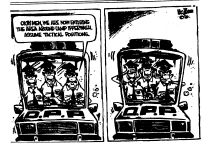 Fantino is shown with a police car emblazoned with ‘peace’ symbols intended to signify the OPP’s abandonment of law enforcement in favour of the force’s appeasement of violent criminals. No one in CANACE had any foreknowledge that Barb Patterson-Tuck was creating this wonderful painting or that we would be honoured by being portrayed in it. We had the chance to thank her personally when she stopped by the Gary McHale campaign booth (2008 Federal election) at the Caledonia fair where ‘Caught in the Middle‘ won first prize in the art competition. CANACE thanks Ms. Patterson-Tuck for creating a work of art that tells the story of Caledonia in a way that 10,000 words could never accomplish.